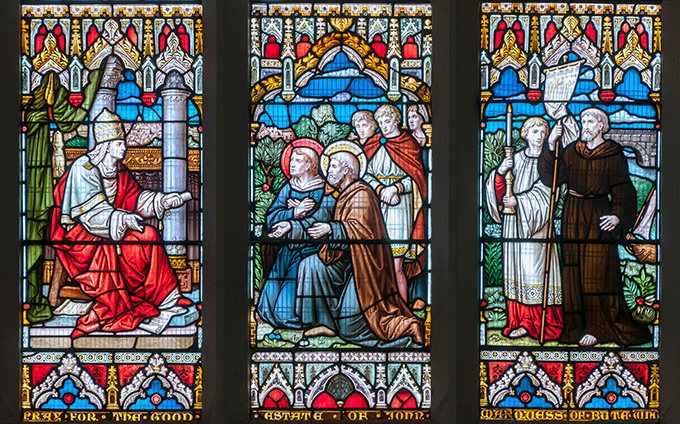 Two conferences this month gave me opportunities to talk about saints in stained glass windows that tell us something about the conflicting national and religious identities. For ‘The MIddle Ages in the Modern World‘, a multidisciplinary conference on medievalism in the post-Middle Ages at the University of Lincoln, I contrasted competing claims on Welsh saints by the Roman Catholic Church and the Anglican Church in the nineteenth and early twentieth century. I also talked about the inherent medievalism in most stained glass since the nineteenth century, which eschewed the use of coloured enamels in the seventeenth and eighteenth century in favour of the medieval mosaic method of making stained glass. The International Congress of Celtic Studies, held every four years, came to Glasgow this year, and my paper, ‘Kings, Saints and Popes: Ancient Britain in Stained Glass During the Welsh Revival’ followed a similar theme but focussed on the legend in which the British king, Lucius, sought the help of the pope for the evangelisation of Britain in the second century. This was a subject occasionally chosen by Roman Catholic and Anglo-Catholic patrons, and implicated the dependence of the early Welsh church on Rome, in contrast to the Protestant projection of an early Welsh church independent of papal authority. Both visits were also opportunities to see the stained glass in two cathedrals that I had not visited before. At Lincoln I was surprised how much medieval glass still survived, and, at the other end of the scale, Glasgow was interesting for the amount of post-war glass commissioned the replace the Victorian glass (by Mayer of Munich, controversial in its time and notable in the involvement of the historian Charles Winston). Both cathedrals, commendably, had books available detailing their windows. 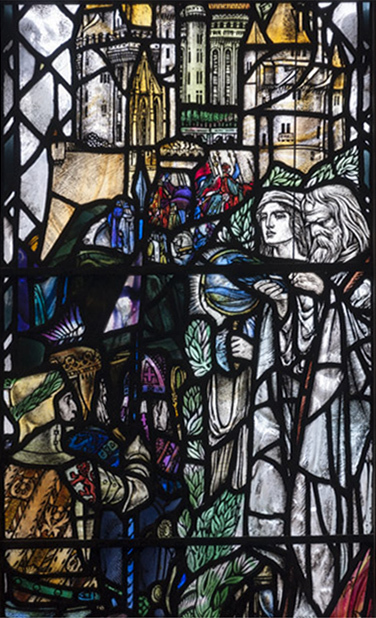 I was particularly struck by the quality of the mid-twentieth century glass in Glasgow Cathedral, featuring Scottish artists whose work I have not come across in Wales, such as Herbert Hendrie, William Wilson and Douglas Strachan, as well as English makers such as Francis Spear and Marion Grant. Excellent work by Douglas Strachan was also on hand where the conference was held at the University of Glasgow, in both the Bute Hall and the University Chapel. The Chapel east window is by Lawrence Lee, a work of 1962 and roughly contemporary with two of his three Welsh commissions. By martin in Events, New research on July 27, 2015 .